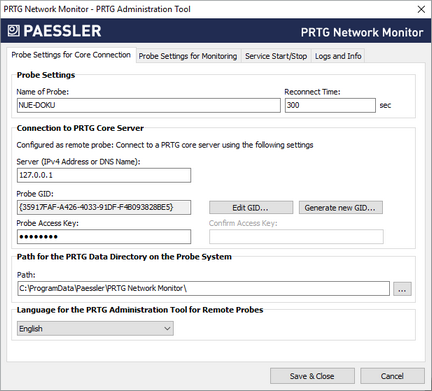 If you start the PRTG Administration Tool on a system on which a PRTG Remote Probe runs, you can define various probe-related settings, restart services, and view log information. You can also change many of these settings via the system administration and the probe settings tab in the PRTG web interface. 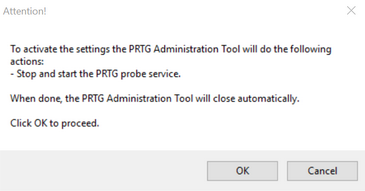 This section describes the available settings in the PRTG Administration Tool when you open the tool on a PRTG remote probe system. This is not the complete set of available settings. If you need access to all possible settings regarding your whole PRTG installation, open the PRTG Administration Tool on the PRTG core server machine. All settings you make here are valid only for the local installation running on the computer on which you open the PRTG Administration Tool. In order to change settings for another installation, for example, another remote probe installation, please log in to that computer and open the program there. To get familiar with the different components of PRTG, we recommend that you read the Architecture section. If you prefer a video introduction to the PRTG Administration Tool, see the More section below for more information. 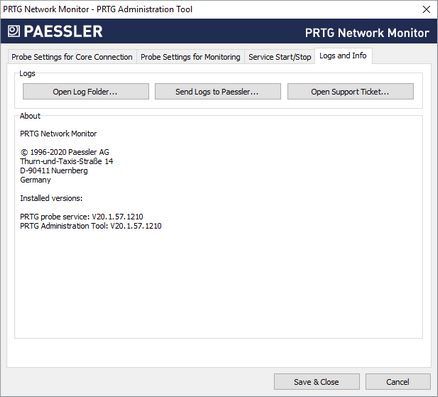 From the Windows start menu, select the PRTG Network Monitor group and click PRTG Administration Tool to open the application. After you have changed settings, click the Save & Close button. A new window opens where PRTG asks you to agree to restart the PRTG core server service. Click OK if you do not want your changes to be ignored. Define general settings regarding the probe and probe connections. Enter a meaningful name to identify the probe. PRTG shows this name, for example, in the device tree, and in all alarms by default. Please enter a string. Define the time that PRTG will wait until the probe tries to reconnect to the core server if the connection fails. Please enter an integer value. These settings affect the way the probe will connect to the core server. A probe is either a local probe, hosted probe, or a remote probe. PRTG will automatically detect the type of probe and show the correct setting options. If this probe is configured as the Local Probe of the PRTG core installation, it will connect to the core via 127.0.0.1, which you cannot change. If this probe is configured as a Remote Probe, enter the IP address or DNS name of the core server. The Probe GID (global ID (GID)) is a unique identifier for the probe. We recommend that you do not change it. Exception: Only if you substitute an existing remote probe from a different computer, you have to copy the GID from the old probe to the new probe. To do so, click on the Edit GID... button and confirm the warning with Yes. You can then change the value. You cannot change the GID for a local probe. You can deny GIDs under System Administration—Core & Probes in the PRTG web interface. If you remove a remote probe from the device tree or if you deny a remote probe after installation, its global ID (GID) will be automatically entered in the Deny GIDs list. You do not need an access key for Local Probe connections. On a Remote Probe, the Probe Access Key must match one of the access keys configured in your PRTG core server installation. If it does not match, the remote probe will not be able to connect to the core server. See section System Administration—Core & Probes for more information. Check also allowed and denied IPs in System Administration—Core & Probes to ensure that the core server accepts the IP address of the remote probe. If you enter an access key for a remote probe, enter it in this field again to assure correctness. Define the data folder to which PRTG will store configuration and monitoring data. Click the ... button to choose another folder on your system. Before you change the path, make sure you stop both the core server and the probe services and copy all data to the new location. Choose the language for the PRTG Administration Tool on your remote probe from the dropdown list. Default is English. This setting will be used for sensors using the following connection types: HTTP, DNS, FTP, IMAP, POP3, Port, Remote Desktop, SMTP, and SNMP. For details about the basic concept of IPv6 in PRTG, see the IPv6 section. You can stop and start PRTG Windows services manually. For connected probes, click Start Probe Service to start the service or Stop Probe Service to stop it. Both actions usually take from a few seconds up to several minutes to complete. 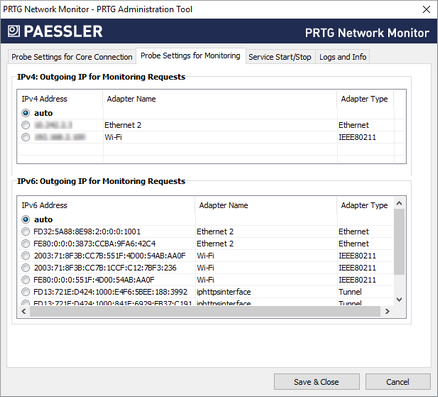 You can also restart the core server and connected probes via the PRTG web interface under Administrative Tools. We recommend that you set a schedule for automatic restarts. You can also define a restart schedule on the Settings tab of a probe under Restart Options, in the PRTG web interface. 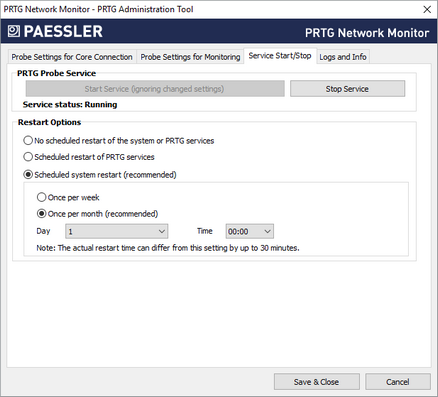 You can also define a restart schedule on the Settings tab of a probe, section Scheduled Restart Settings, in the PRTG web interface. Open the PRTG Network Monitor data directory on your hard disk drive to access all logfiles that PRTG creates. Open an assistant to send logfiles to the Paessler Support Team. See below for details. You can send logfiles more easily with the support bundle via Contact Support in the PRTG web interface. 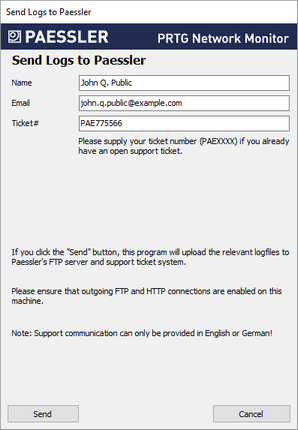 This will open the support form on the Paessler website in a browser window. If you need help, we recommend that you use the Contact Support option in the PRTG web interface instead. The About section shows information about the version of installed PRTG programs and copyright. If you open a support ticket, Paessler Support might ask you to send logfiles for further analysis. With the Send Logs to Paessler... button, PRTG will automatically collect, compress, and send your logfiles to our FTPS server. Enter a valid email address. You can provide any of your addresses, but we recommend that you use the email address of your PRTG account, which is entered by default. This field is optional. If you have already opened a ticket at Paessler Support, please provide the ticket number you received. Your files will then be associated with your ticket automatically. Please enter the ticket number starting with PAE followed by four or more digits, for example, PAE12345. If you do not have a ticket number, leave this field empty. Click the Send button to start the data upload. Ensure that FTPS and HTTP connections are allowed on this machine.